Welcome! Today, I share with you Quinn Popcorn! 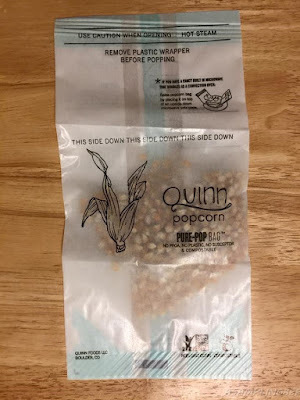 A popcorn that is made with a Non-GMO Organic corn. The company uses real ingredients in their products. You will not find any yucky preservatives in this delicious popcorn! Available in microwaveable bags and in bags where the popcorn is already popped. Flavors include: Real Butter & Sea Salt, Parmesan & Rosemary, Vermont Maple & Sea Salt, Hickory Smoked Cheddar and Just Sea Salt. GMO Certified. 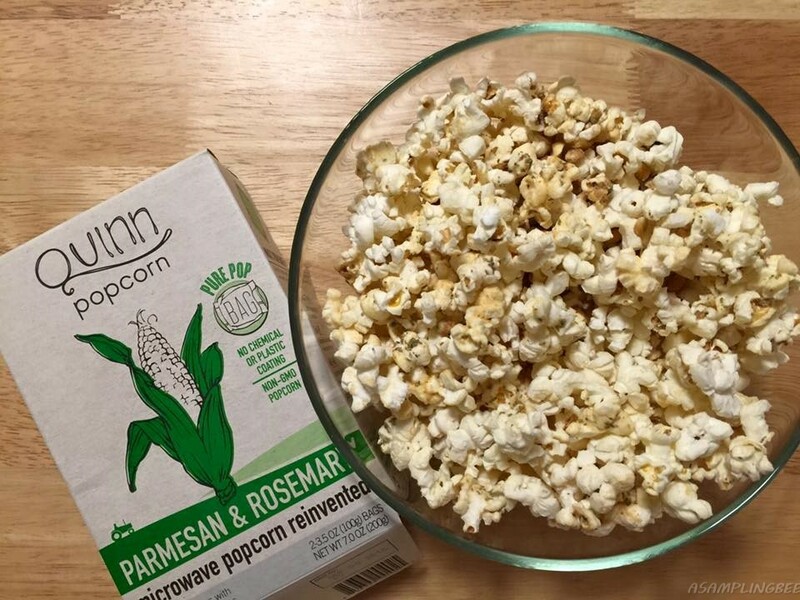 Quinn Popcorn has kicked GMO's, preservatives, flavorings and unpronounceable ingredients to the curb. You will never, ever find any unhealthy ingredients in their products. Even the bag is safe. The bag does not contain any chemical coating or metalized plastic heating elements. The PurePop bag is made compostable paper. Quinn Popcorn is a must try! Visit Quinn Popcorn's Store Locator to find their popcorn in a store near you. I tried the microwaveable bags of popcorn. This option allows you to pop the popcorn and then add the toppings yourself. Just pop a bag, add packet number 1 to the bag and give the bag a good shake. Then, add packet two and shake again. That is it! Having the option to add your own topping to your popcorn is awesome because you know what's going on each kernel. Natural, healthy toppings that is! The popcorn pops nice. You know how sometimes you pop a bag of popcorn only to find that the bag is half full? Not with Quinn's. The entire bag was FULL of delicious popcorn. I tried the Parmesan & Rosemary Popcorn and it is delish! I must admit that I ate almost the whole bag! The popcorn was cheesy and perfectly seasoned with just the right amount of Rosemary. So so good! I am a huge popcorn fan and I look forward to popping several more bags of Quinn Popcorn! And once I find a bag of already popped popcorn in my area, I will be indulging in that, too! 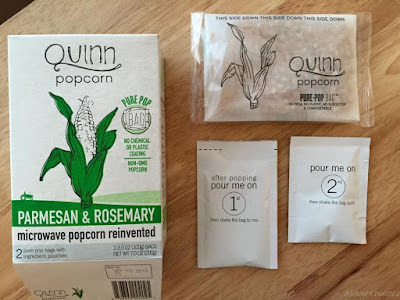 *Quinn Popcorn sent me some free product coupons to create this blog review. All opinions are my own, Always! 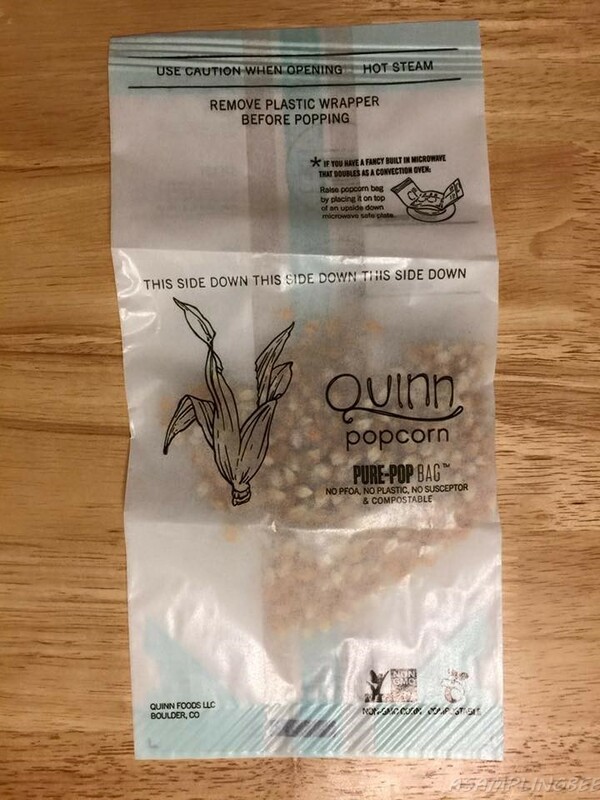 Thank you, Quinn Popcorn! That's an interesting sounding combination of flavors. I think I'd really like it because I put rosemary on so many of my dishes. My family would enjoy this popcorn. We are big popcorn eaters in my house. My hubby LOVES Rosemary so this is perfect! I know what to do the next family fun night for a snack. What an awesome snack this is. I Love flavored popcorn, so I need to try this. I definitely have to try out some Quinn popcorn. I like how waste-free it is and it's great that you add the toppings yourself. Oh yum! I love rosemary--this sound like a great snack! I'm not a big popcorn person but my son is. I wonder if he would enjoy this. I have never heard of Quinn's popcorn. I am going to try this out the next time we buy popcorn. This looks great! My family loves popcorn! I love that you can add your own topping on this one. This will be perfect for our Friday movie nights. Awesome! 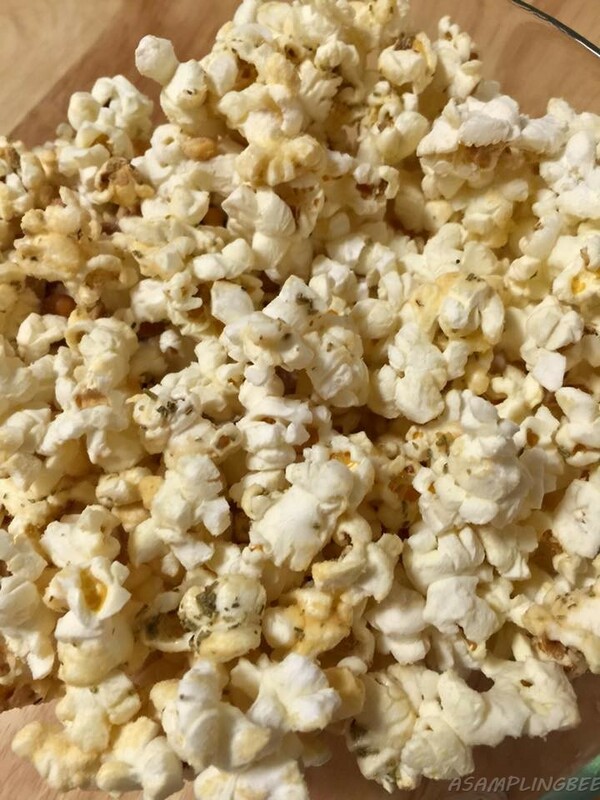 I love snacking on pop corn and experimenting on flavors as well. This sounds yummy! Definitely worth a try. I haven't ever heard of this popcorn. It looks really yummy. I'm gonna have to keep an eye out for it when I go to the stores! Quinn popcorn are very perfect for midnight and movie snack with family. Wow! I love popcorn! Will have to try Quinn Popcorn out! Looks delicious and I love that it's a healthier and safer option! Oh, this is new!! My hubby loves popcorn, especially on our movie night!! Thanks for the share! I love popcorn so much I always want to eat it, when I see it I have to eat it. I have never heard of this but I LOVE popcorn. I am going to have to look for this for movie night on Friday!